Niloofar, 35 years old, lives alone in Tehran with her aged mother, and stays busy with her tailoring shop. Tehran's air pollution has reached maximum levels, making it hard to breath. When doctors insist that her mother must leave smoggy Tehran or she will have not long to live, Niloofar’s older brother and sister decide that she must also move away to the countryside to accompany her mother. Niloofar is torn between family loyalty and living her own life and pursuing a potential love interest she has kept secret from her family. She is the youngest and she has always succumbed to family pressure, but this time she decides to stand up for herself. Official Selection, Cannes Film Festival, Un Certain Regard. Born in 1972, Behnam Behzadi started his career as a photographer and theatre actor at the age of 15. He graduated from the Faculty of Cinema and TV in Tehran with a BA in filmmaking. He has made more than 20 films including shorts, TV movies and documentaries, some of which won various awards in international film festivals, especially his first feature, Before the Burial in 2008. His previous film, Bending the Rules won the Special Jury Prize in Tokyo, the Audience Award in Nantes and the Special Prize in Mannheim. Behzadi teaches Cinema at the Tehran University of the Arts and has published many articles and essays. Inversion is the first of his films getting a UK distribution. "The first dramatic feature by short film and documentary-maker Behnam Behzadi, represents Iran in the Un Certain Regard section of the festival. The theme of a woman seeking self-determination in the face of society’s restrictions is one that has remained in the forefront for contemporary Iranian directors. 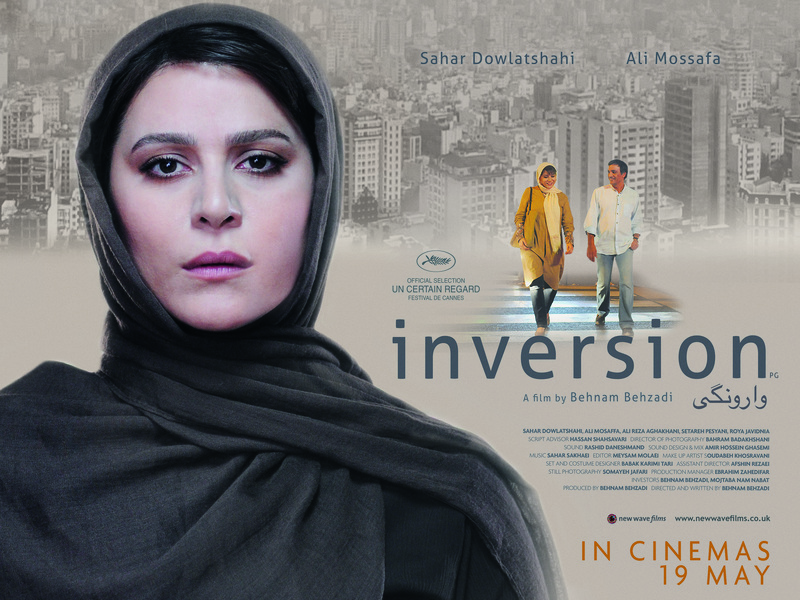 Although not social realist in its style, “Inversion” addresses real issues regarding a woman’s freedom to choose her own life in the face of the overriding grip of family obligation. Behzadi’s storytelling is conventional, but the film’s appeal lies in its revealing construction of the web of family obligation and filial responsibility. 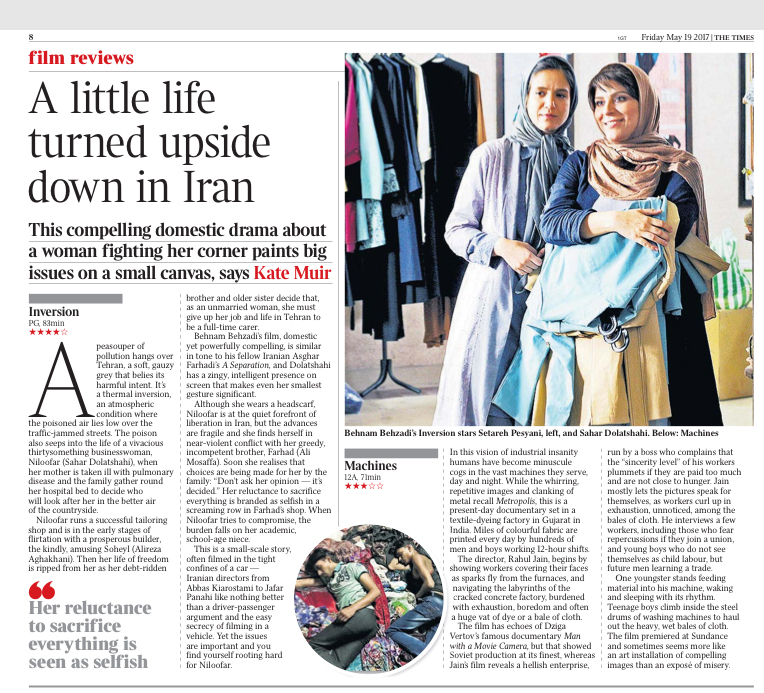 Iranian filmmakers are used to working with metaphor and fictional subterfuge, and this director’s underlining of the concepts of inversion, independence, and self-determination can be read with a wider meaning."